Jenne Rayburn Displays New Work In Boston Craft Galleries For The Holidays And New Year. Just in time for the holiday shopping season, Boston area craft and jewelry galleries will feature new pendants, earrings and other costume jewelry works, as well as couture handbags, by local designer Jenne Rayburn. 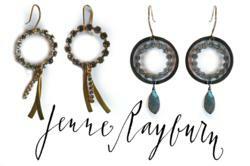 Each piece in the Jenne Rayburn collection is designed, crafted and assembled by hand at Rayburns studio in Malden, MA. Designs reflect seasonal fashion inspirations and are crafted to accessorize contemporary and classic wardrobes. As a trained metalsmith and enamellist, Rayburn incorporates ancient jewelry techniques into her work, as well as antique and up cycled components from her extensive travels. This seasons signature jewelry pieces center around the themes of glamorous holiday parties with glittering vintage crystal, the twinkle of reflected light and the luster and contrast of gold mixed with antique silver, reflecting Rayburns love of mixing contemporary with antique. Ive been working with local antique dealers to curate the vintage Swarovski crystals and cut glass in this collection, says Rayburn. Prior to each season I consider the components and stones available in the markets, and the fashion trends as shown at fashion week around the globe, to create unique and timely capsule collections. I only buy the best stones and utilize the highest quality materials. Wearing great pieces of designer jewelry makes women look and feel beautiful. You can find Jenne Rayburn jewelry, handbags and scarves at the Limited Edition Gallery, in Newton Highlands, MA; the Hourglass Gift Gallery in Melrose, MA, and the Karenna Maraj Gallery in Belmont, MA. Karenna Maraj Jewelry Collection was established in 2010 as a gallery & studio space in which to sell original jewelry created by jewelry artists and metalsmiths and also to provide classes and open studio space to the local community. Today Karenna Maraj Jewelry Collection represents 56 local artists. Each of the artists is known for his or her distinct style and use of materials. All work is handmade and is one-of-a-kind or of limited production. Collectors frequent Karenna Maraj in search of new works by their favorite artists. Limited Editions is a gallery and shop located in the village of Newton Highlands, just a few miles west of Boston. Jo-Ann Freedman, owner for over 36 years, continually showcases high quality and distinctive work by American craftspeople. As you walk through the gallery, you will discover and be delighted by a whimsical and eclectic mix of color, texture and design. This entry was posted in Which Open Source Blog and tagged Boston, Craft, Displays, Galleries, Holidays, Jenne, Rayburn, Work, Year on January 10, 2013 by Administrator.